In Bobby Kennedy: A Raging Spirit, author Chris Matthews’ focus on Bobby reflects what passions drove the lesser-known Kennedy brother. Bobby was easily his mother’s favorite—a young man whose passions quickly moved to those with fewer options in life. A passion his father did not understand. His relationship with older brother Jack was often driven through conflict as well “Jack and Bobby simply were different, always.” But as Matthews observes, “They didn’t really become close until 1952, and it was politics that brought them together.” As political opportunities opened for Jack, he was astute enough to recognize Bobby’s value as an organizer and his willingness to be “the bad guy” by shielding Jack from uncomfortable situations. Matthews is skilled at weaving tension and conflict throughout the book. One doesn’t just read the words, but experiences the tension and emotions as Bobby rails against racketeering, racism, political forces, poverty, and international issues, especially Communism. Among one of the most interesting discussions is in Chapter 16, where Matthews is particularly adept at describing the tension at the White House as the Cuban Missile Crisis unfolded. Matthew’s discussion of the Bay of Pigs and the Cuban Missile Crisis sheds light on the backroom workings of how the Kennedy administration handled such watershed moments and the role that Bobby played in bringing the issue to a peaceful end. When Jack decided to run for president, there was only one man who could organize and run the campaign, and that was Bobby. However, “th[e] difference in their outlooks would reveal itself sharply in their view of one man: Lyndon Johnson.” Jack’s decision to ask Johnson to be his vice presidential choice did not sit well with Bobby. Bobby’s dislike and distrust of Johnson ran deep and long, and this is detailed throughout the book as well as when Bobby considers his own options for a presidential run in 1968 as a challenge to President Johnson. Civil Rights issues sat heavy on Bobby’s heart; with MLK’s incarceration in Atlanta, Coretta Scott King sought help from Harris Wofford of Kennedy’s campaign, and the wheels were set in motion. After Jack called Mrs. King expressing his concern about her husband, Bobby was initially furious. After several hours of consideration, however, he experienced a change of heart as he considered the abuse of power expressed by the judge in the King case. Matthews’s writing style is particularly engaging when he weaves his own experiences into the story. Explaining where he was in his life’s journey during the various events—President Kennedy’s assassination, MLK’s assassination, the Vietnam War, Bobby’s assassination—gives a personal perspective to Bobby’s story. Matthews’s political experiences also gave him insight into the inner workings of political campaigns, and he is able to pick through the obvious and share the depth of what it takes to run a successful campaign. 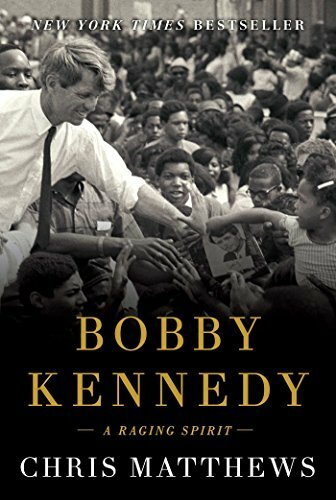 The depth of Bobby Kennedy: A Raging Spirit provides insight into this man’s spirit and what drove him to greatness. Matthews does an excellent job of pulling Bobby out from behind any family shadows to give us an in-depth portrait of what could have been. One can only hope that there might be another Kennedy in the wings of Chris Matthews’ writing.